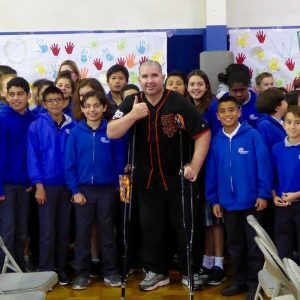 Bryan Stow of the Bryan Stow Foundation recently presented an anti-bullying presentation to St. Mary School students in Kindergarten through 8th grade. Through a generous donation from the St. Mary School Mothers’ Guild, Bryan Stow visited the school and talked with students about what it means to be a bully, the effects of bullying, and how to recognize and prevent it. Mothers’ Guild hosted this program to support the school’s parent-run ABC Project Cornerstone and Second Step, bullying prevention and positive peer-interaction programs. Bryan Stow was a paramedic in the Bay Area and a San Francisco Giants super fan. In 2011, he attended a Dodger game in Los Angeles and was brutally assaulted by two men. The attackers nearly took his life, and while Bryan survived, he was left with many serious injuries and disabilities. Initially placed on life support, he spent many months in a coma, and when he came out of it, faced a long, uphill battle to regain his ability to speak, read, write, eat, stand and take care of his basic needs. As part of speech therapy, his therapist took him out to schools to tell his story. That effort turned into the Bryan Stow Foundation whose mission it is to teach students how to effect a change in attitude for kids with bullying tendencies, to stop fan violence, and to live kinder lives. With help, Bryan now visits schools and organizations to share his powerful story and anti-bullying message, including cyberbullying for older children.